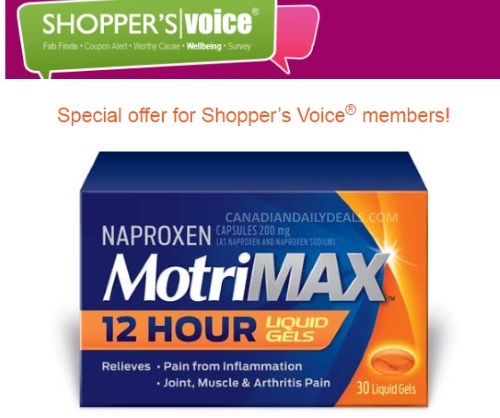 Check your emails if you're a Shoppers Voice member! They sent out free trial samples of MotriMax 12 hour liquid gels to select members earlier today! Quantities are limited and may run out. Please allow 6-8 weeks for delivery. Were you chosen for this offer? Let us know on our Facebook Page. Not a Shoppers Voice member? Click on the link below to complete their current survey, it's free to join and they send out free samples and coupons offers throughout the year based on your survey answers. Please note, you only have to do the survey once, you won't improve your chances of getting anything by doing it over and over.